Y’all! I’m about to go through it! If you read my previous posts, then you know that God and I have this interesting relationship. It’s like a real human one. Sometimes I don’t talk to Him if I’m mad. I giggle to myself when I think about how much He loves me. I cry sometimes when I think about the sacrifice He made just so I can be here. I yell at Him sometimes too when I think He’s ignoring me, not responding, or when I feel like I’m a sitting duck. Even through allllllllll that, He loves so very much. He loves me enough to let me go through my junk so I can come out stronger on the other side which is progressively turning me into the woman He designed me to be. The best part is I’m NOT going through this alone. Yup…He’s with me. So dig this. Oh wait…before I go on…I finished my first module of my TEFL certification course. WHOOP WHOOP!!! I ain’t playing. Okay. So i’m scheduled to have a surgery on Wednesday. When my doctor and I talked 2 weeks ago she said I have the option of choosing one out of the 3 hospitals to have this surgery. One of them was actually close to where I currently live. So I chose there. I went home and told my parents the hospital where I will be having this surgery and my mom flipped out. You see, this particular hospital has the WORST reputation in town…meaning…you check in but you don’t check out. I promptly told my mom, “What is the point of us praying and claiming that we believe a GOD who can do all things if we’re freaking out about a hospital that NOBODY likes?” She calmed right down and said you’re right. Funny thing is a couple days later my mom’s comment got to me and I called my doctor asking to be switched to another hospital. They said they would try. Welp…today I got the call that the hospital i wanted is completely booked and so was my alternative. The ONLY hospital available was the one that NOBODY likes and has the worst reputation. So I said, “Well you know what? I trust my doctor so it’s cool.” A few minutes after I hung up the phone as I was driving, I heard, “No. You need to trust ME.” All I could do was shake my head in agreement. Oh! It gets better. After my surgery I will be out of work for a month recovering per doctor’s instructions. I talked with my supervisor about it and he said i needed to talk with HR about FMLA so I can get paid while on sick leave. I talked with HR today and they sent me the paperwork via email. I opened the email and started reading and I saw in bold letters “UNPAID” while on medical leave. Yup. Ya see I’ve only been with my company full-time for less than 12 months so I’m not eligible for FMLA. *sigh* All i can say was, “Man. I”m about to go through it.” Check this out. Not working for 30 days without pay means, the following things will suffer; car note, car insurance, Sallie Mae, phone bill, a few debts i’m trying to pay off…shall I go on? Whew! Ladies and gentlemen, I have not choice but to trust God. I don’t have a pot to piss in or a window to toss it out of. I told myself…hell…i’m still telling myself that I CAN NOT WORRY ABOUT THIS. I have to trust God. During my recovery process, it will do me no good to worry and stress out about my financial situation and plus i need to focus anyway to continue doing my modules so i can pass this TEFL certification LIKE A BOSS! Yeah…i’m about to go through it, but i won’t be going through it alone. I have to trust Him. 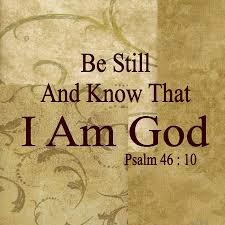 I have to be still and know that He is God. Period. Something tells me He’s gonna show out too. I’ll be on here blogging a little more keeping you guys updated. I’ve given Facebook a break. It was needed.